The mission of the Alma Community Art Center is to create a space for the community to have exposure to educational art opportunities for all ages and abilities, offer an artist mentoring program for children and young adults, and to provide community gallery space. We provide a regional mid-Michigan location for area visual artists to share both their artwork and their artistic skills with their community through displaying, selling and instructing in their art. In a collaborative effort, the Creative Arts Guild of Mid-Michigan, the Pine River Arts Council, Alma College and area schools provided the initial funding to establish a community art center located in Alma, Michigan. Discussion, planning and collaboration began in August of 2011 when a vacant storefront in downtown Alma was donated for a year to develop the art center. Community volunteers spent many hours cleaning and renovating the space prior to opening the Center on November 11, 2011. 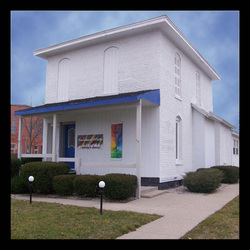 Initially called ArtVentures, with a name change to Alma Community Art Center occurring in August, 2012, the Art Center has had an immediate positive response and support from the area communities. Funding for our programming, publicity, exhibitions and part-time staff has come from class fees, commissioned sales, monetary donations and grants. The Alma Community Art Center has found a permanent home at 318 Woodworth Avenue, and is currently renting space next door at 312 Woodworth (the Annex) during construction. Future plans also include expansion of our banner project to include more communities, and to take our classes and instructors out into the communities to provide art instruction opportunities those who may have difficulty getting to the Art Center.